If you've been around the blogosphere for at least a couple of years, you'll know that this spotted clutch is basically owned by A LOT OF PEOPLE. I remember when I first saw it carried by a top blogger, it was only a matter of days until what seemed like every fashion blogger had the Clare Vivier clutch. I immediately wanted in on the bandwagon. Not because it was so popular, but because it's just such a well-designed piece. I love the fold-over style because it holds more than a flat clutch, and I really am enamored with the print. Subtle, not at all garish like some leopard or cheetah can be. Leopard is a neutral, but I think it sometimes runs the risk of looking a bit dated if not done correctly. So for months, I've been going back and forth, especially when Shopbop has a sale. I never pull the trigger, I just make a mental note of how much I like it, but then proceed to the Express website where I get yet another barcelona cami because that makes sense right? Can never have enough of those! I do spend money on handbags, as I mentioned in this post. But for some reason, I just could never bring myself to splurge on Clare V. So when I saw that an online boutique was selling a similar looking alternative for a fraction of the price, I went for it. The shipping was super fast! The quality is great, very soft and malleable. I'm sure it can't compare to the real thing and full disclosure, I've never seen the Clare V in person. However, if you're looking for a less expensive option then I highly recommend it. It is currently on the website for $45 dollars, but I purchased it during a promotion so it was a bit less. Still worth it in my opinion. Great find! I love it! I've lusted over the Clare V for months, I am loving your skirt. I need something similar. Love this clutch. I also do spend more on handbags, but not clutches. Because I use my handbag for work every day but clutch is more special occasion for me. and out of topic but also loving your suede skirt and the colour is fab. I may be pulling the trigger on getting one. I have long legs and tend to find mini skirts too revealing on me but I will make this one work. I agree, it's hard to justify spending money on a bag you can't carry daily. And thank you regarding the suede skirt! I love it. Very comfortable and of course soft, and the color is even better in person! I tried to link the exact one, but I got this a few months back. 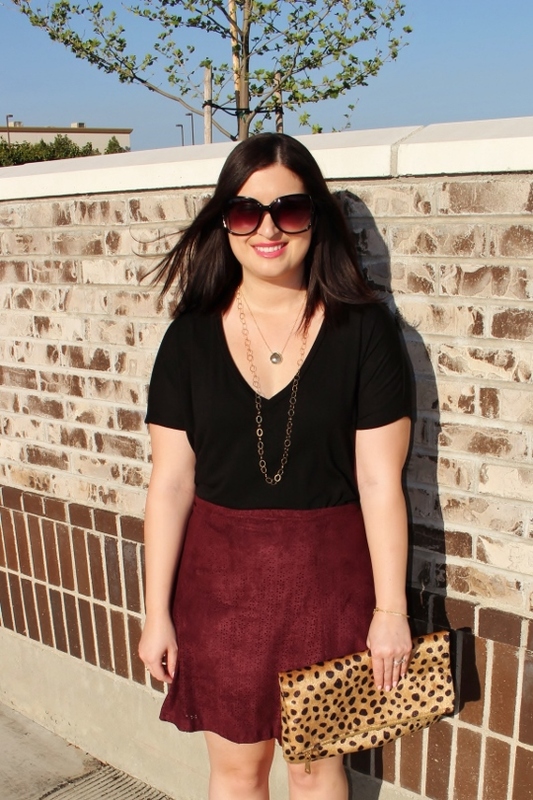 Suede skirts are trendy this year too though so I hope you find one you like! The ones I linked to don't seem as short. I wouldn't wear this to work either, weekends only! Okay, I know this is about the clutch but don't you just love those One Eleven tees? I think the short sleeve version might be my favorite. Naturally I want to collect all the colors and I only wish they would put them on sale! Your new clutch look great and it makes perfect sense to go with more affordable. It looks so similar to the real Clare V! Yes, these tees are my new addiction! I think they may take the place of Barcelona camis. I know, crazy right?! They are so soft and flattering. They look great with jeans, leggings, and tucked into skirts. I'm sure they will look great with shorts too! Very versatile!